When I initially purchased my Toyota FJ Cruiser, engine performance was the last thing on my mind. The 1GR-FE 4.0L engine had more than enough pulling power to meet the needs of the everyday driver. Even pushing the stock weight of an FJ Cruiser at nearly 4,300 pounds posed no difficulty for this well-built engine. But as time went on and the upgrades continued, the FJ’s love handles began to show and performance wasn’t what it used to be. Mind you, adding on some skids and a bumper isn’t going to turn the FJ into a complete slug. But over time, those who invest in the heftier upgrades will no doubt begin to notice performance degradation. Knowing that my upgrade plans were far from over, I decided it was time to begin looking around for ways to boost the FJ’s horsepower. And rather than building boost in small increments through chips and high-flow exhaust systems, I decided to go with a supercharger solution. 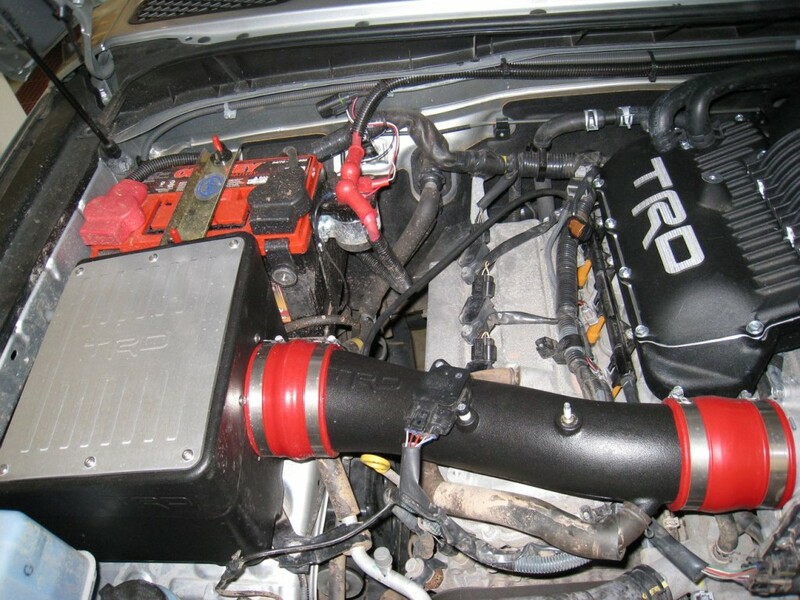 At the time of this decision, there were two possible supercharger systems available, one from Toyota Racing Development (TRD) and an alternative system offered by a company named Underdog Racing Development or URD for short. Both offerings were great systems but each had their pros and cons. 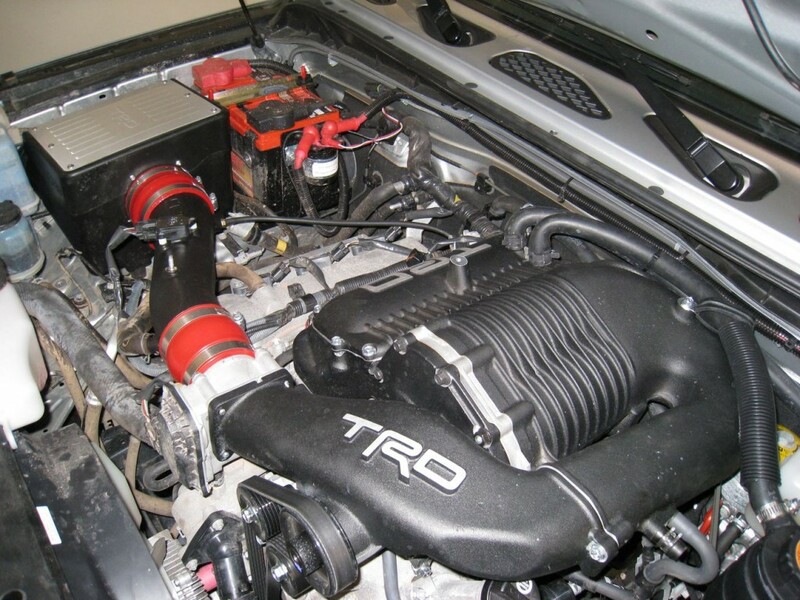 One of the primary advantages to the TRD supercharger is that it’s completely covered by factory warranty. The caveat to this is that you must have a Toyota service technician perform the upgrade which means no do-it-yourself installations. The URD supercharger system is not covered under factory warranty – in fact it will no doubt void your factory warranty completely, or at least the drive-train portion of it. But the URD has the advantage of providing a significant increase in both horsepower and torque, much more so than the comparable TRD system. So if you’re looking purely for speed and top-rated performance, there’s no question that URD should be your first choice. 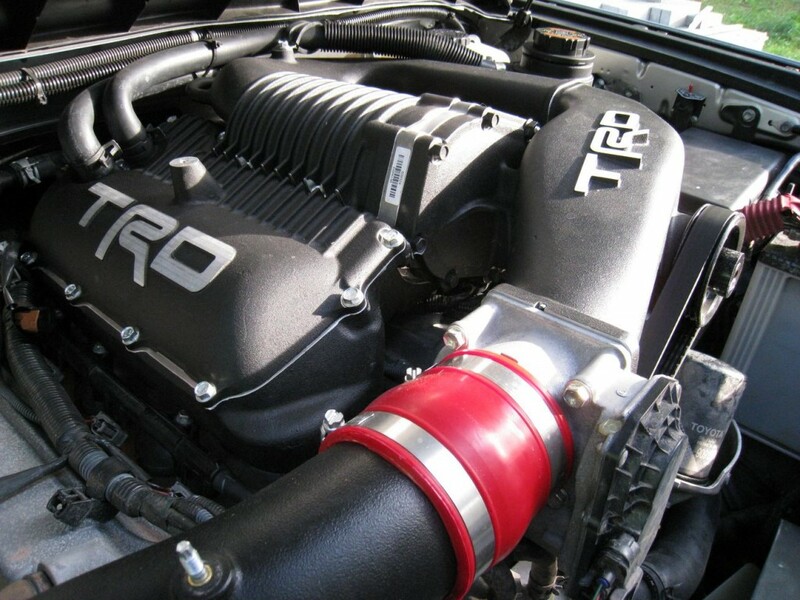 The TRD supercharger system is a Roots-style supercharger produced by Eaton, whereas the URD model uses a centrifugal Rotrex blower design. I’m still in the process of learning all the differences between these two systems, as well as the contrast between superchargers and turbochargers. Since there are currently no readily-available turbo solutions for the FJ Cruiser, I’ll focus this article on superchargers for the moment. The information provided below is based purely on my own research so please don’t consider me an expert in the field. The following data is simply a synopsis of what I picked up when I was researching and comparing the two styles in order to determine which one would better fit my personal requirements. Our first competitor is the Roots-style supercharger, which has been around since the mid-1800’s, although according to sources, it wasn’t employed for use in engines until much later. These superchargers are known to be much less efficient than the more modern centrifugal models, but are also much simpler in their design and operation. If my research is correct, they also deliver better low-end torque more quickly than the centrifugal units, which experience much greater lag time when building boost – similar to a turbo. The longevity and simplicity of the Roots-style units allows them to be produced at a much lower price point than the Rotrex models which makes them a more popular choice for those consumers who are trying to stretch their modding funds. The opposition to the Roots-style comes in the form of a centrifugal-style supercharger, more specifically the Rotrex design. The primary advantage to the Rotrex unit comes in the form of something called “adiabatic efficiency”, a term used to describe an air compressor’s ability to compress air without increasing air-charge temperature. As with any engine, lower air temps allow for greater compression and increased volume. This allows the engine to ingest more air (thus increasing the fuel intake as well), which will ultimately equal more power. The Roots-style superchargers average about a 40-50 percent adiabatic efficiency rating whereas the typical centrifugal units come in around 60-65 percent. The Rotrex design, however, claims even higher numbers, stating they’re able to achieve adiabatic efficiency levels of 80 percent or more. The internal design of the Rotrex units also give them the added advantage of reduced noise levels versus the Roots-style units which emit a very audible “whine” at higher RPMs. For many enthusiasts, this last aspect would actually be considered a disadvantage since most gear heads prefer to hear audible proof of the power within. But the lack of noise in no way translates to poor output. The top end Rotrex superchargers can achieve much greater performance numbers than the Roots-style units could ever hope to reach. So for those looking for the ultimate power mod, a Rotrex supercharger should be the clear winner. All in all, both designs have strong points and weak points. In this case, we are looking more specifically at the TRD vs URD units available for the FJ Cruiser. The above comparisons still apply but there are a few other manufacturer-specific factors to consider to make this battle a bit more equitable. Baseline price for the URD model is going to push the $6000 range, and that’s just for the supercharger parts. You will either need the expertise to install it yourself, or you’re looking at another $1000 or more in installation costs. In addition, the higher-performance output of the URD unit will require additional upgrades to other components, such as brakes, transmission, gears or more. The URD brings a lot of power to the table, but there’s a price to pay for adding that much horsepower and torque to a stock vehicle like the FJ Cruiser. The TRD model, on the other hand, comes in at a much lower price point, sitting around $3800 for a complete supercharger kit. Installation costs would be roughly the same, but no additional upgrades are required to other components. The TRD model is quite capable when it comes to adding power to the FJ. But the power added is still well within the specs and capabilities of the stock components. This not only reduces costs (since additional upgrades are not required), but allows Toyota to offer full factory warranty coverage for all TRD superchargers installed by a certified Toyota technician. Lastly, although hardly a deal breaker as it’s simply my own personal opinion, the aesthetic design of the TRD model is much more impressive and stylistically appealing than that of the URD model. In the end, for my particular needs, I opted for the TRD, Roots-style supercharger, for all the pros mentioned above – price, warranty, low-end torque and cosmetic appeal. All were factors when considering which one worked better for my needs. I’ve never driven a URD-equipped FJ so I really can’t compare it to the TRD’s performance. But I can say that for a vehicle that weights almost 5000 pounds, the TRD supercharger was well worth the purchase price. It’s not going to qualify at the track any time soon, but it adds a significant amount of boost to a vehicle whose performance had slowly been waning over three years of ownership. The more equipment bolted on or carried within translated to reduced performance – a reduction that was becoming more and more apparent over time. This is one of my favorite mods and if I had to do it all over again, I wouldn’t hesitate to invest in a supercharger solution. And although the URD units are nice, I believe I’d choose the TRD again as well. It just seems to be the better option and the best overall compromise for my purposes. Since I was adding forced induction to the list of performance mods, I decided I might help things along a bit by replacing the stock air box with a higher-flow, cold air intake (CAI). Although the stock air box is technically qualified as a CAI, the flow is somewhat restricted compared to some of the aftermarket solutions. There are multiple options available for aftermarket intakes but based on popular reviews as well as aesthetics, I selected the TRD CAI. This intake comes with all the parts required for installation, including an oil-based, high-flow filter. Having followed the research and statistics of oil-based filters over the years, I have to tell you, I’m not a big fan. There’s simply too much variance in air flow during usage, resulting in either too much restriction or not enough filtration. Luckily, AFE offers a composite, dry-flow filter in the same size. The Pro-Dry S, is comprised of a composite media and does not require any oiling whatsoever. These filters are even washable, allowing them to be re-used just like an oiled filter. 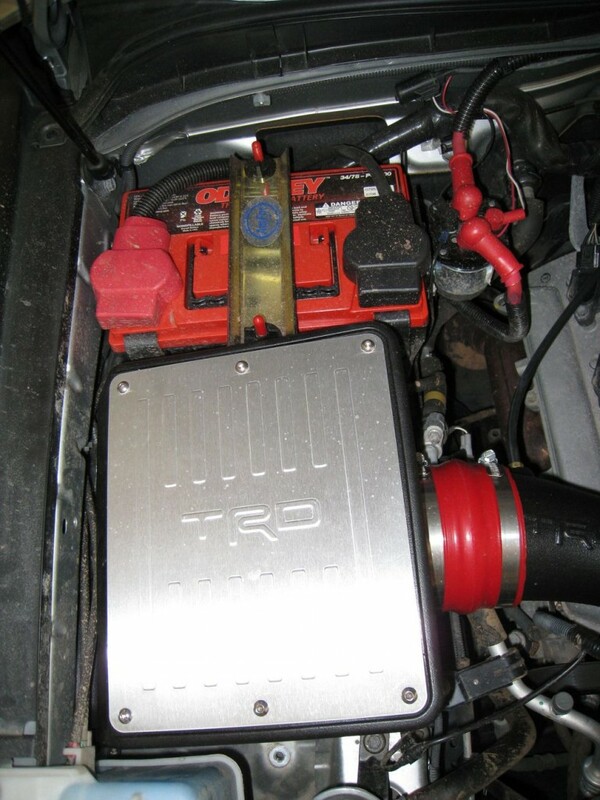 To save on installation costs, I decided to order the TRD CAI kit and swapped out the stock air box myself. All parts and detailed instructions are included, making this one of the quickest and easiest modifications to date. I had the old box out and the new CAI installed in less than 30 minutes. Instead of using the oiled filter provided, I installed the Pro-Dry S filter in its place. Once installed I decided to test everything out. At idle there was very little difference in sound. However under partial or wide open throttle (WOT), there was a noticeable improvement, producing a nice throaty growl from the exhaust. 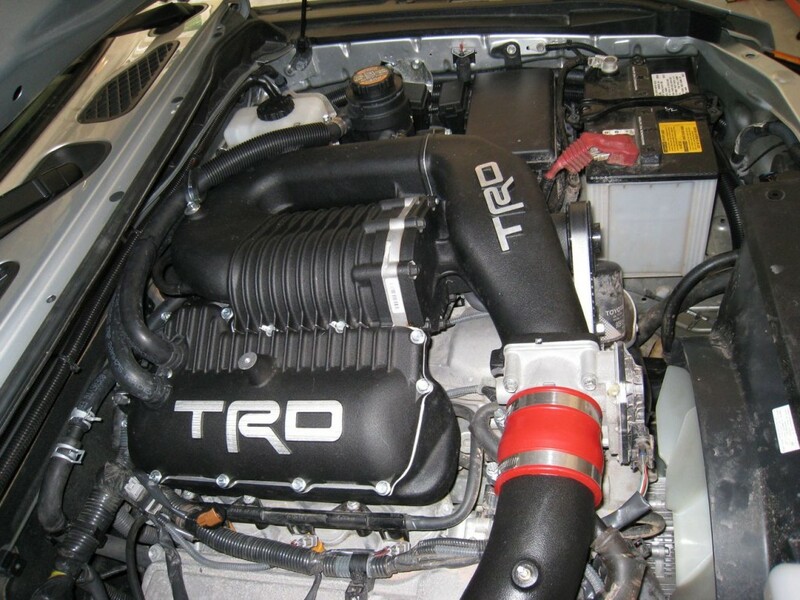 It should be noted that some dealerships do not support the use of a TRD CAI in tandem with the TRD supercharger and have actually refused to perform the supercharger installation if one is installed. This is strictly for legal (READ: EPA) reasons since it’s been proven again and again that both these items work perfectly fine together. 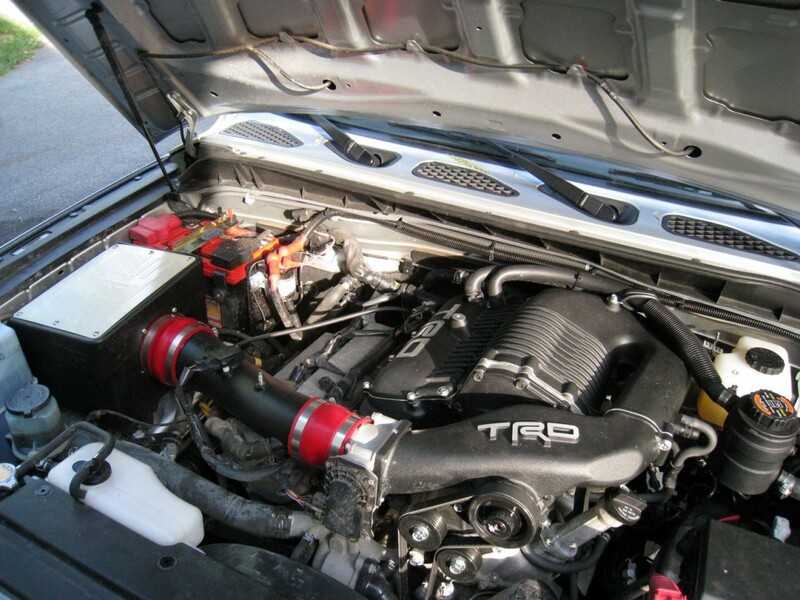 If you are looking to add a dealer-installed TRD supercharger and your local dealer is hesitant due to the presence of a CAI, I would suggest finding a different dealer. Another option is to re-install your original air box temporarily, wait until after the supercharger is installed, and then re-install the CAI. 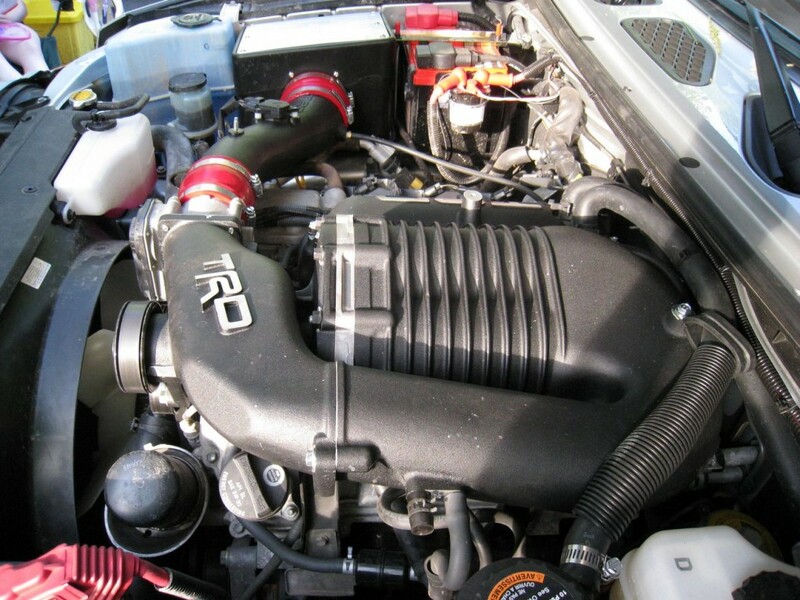 If you’re looking for a great deal on a TRD supercharger, I recommend ordering the parts through TRDParts4U.com. You can pick up your TRD supercharger components, your TRD cold air intake, and your FJ Cruiser supercharger fit kit all at once. They often sell well below the MSRP which means their prices are generally quite a bit lower than what you’ll find through your local dealer. Since I don’t have the expertise for this type of installation and I wanted the parts and labor covered under factory warranty, I opted to have my local Toyota dealer perform the install. Once the parts arrived, I simply scheduled an appointment to have the work done. It was an all day job and I believe they charged me for 8-9 hours of labor with an out-the-door cost of around $900, but labor costs will most likely vary depending on the individual dealer. To give you an idea as to the performance increase, I’ve listed the before and after statistics below. The numbers listed “at crank” are based on Toyota’s advertised specs. The other set of numbers is based on the more realistic “rear wheel” performance. These numbers were obtained by running the FJ on a dynamometer or “dyno” as it’s known in the industry. Comparing the two sets of numbers, there was an overall increase of 79 horsepower and 69 foot pounds of torque. Based on the advertised numbers at crank, it would appear that Toyota is hedging on the low side of the numbers. A more realistic assessment would around 318 horsepower and 347 foot pounds of torque at the crank. But even with the advertised numbers, it’s still not too shabby. There’s not much to tell really. Since the TRD cold air intake and supercharger were installed almost a year ago, I’ve had no significant issues with either component and the performance benefits have been amazing. While I can still feel my trailer when towing, the response while pulling is significantly better with the supercharger. If I had it to do all over again, I would not hesitate to add a supercharger. If anything, I would probably add it much sooner. As far as TRD vs URD goes, I believe my decision would be the same. The TRD unit just fits my needs better and knowing that it’s all covered by factory warranty provides great peace of mind. Great article! By far the best one I found on the web. Do you know your 0-60 time? When you put the supercharger on the Fj did it change the gas milage? Yes, the mileage did decrease somewhat (1-2mpg) after the supercharger was installed. However, this was primarily the result of my “lead foot”, not necessarily a side affect of the supercharger installation itself. The extra power adds a nice bit of boost and it’s hard not to make use of it once it’s available. Plus, to be honest, mods like skid plates, suspension lifts, larger tires and wheels will drastically reduce fuel efficiency. I actually spent the first 3 1/2 years tracking gas receipts before I finally just gave up on my mileage. For me, the added benefits of the mods will always outweigh the added cost of fuel. It all comes down to what’s important to you. I have recently installed a TRD SuperCharger myself. I also have a TRD CAI and catback.. Although doing so wouldn’t have changed my mind but I really wished I could fine your article waay ago… Great build up you’ve got right there.. I think I will switch my oil filter too and see if I get a noticable sound.. I really like to hear the growl of my FJ and that’s the only reason the next mod in line is a set of headers! Thanks for visiting the site. With regards to your question, the supercharger is designed to work with either air intake. Unless they’ve changed something recently, the flash update is pre-programmed and is based on your stock air intake but will work fine with a TRD CAI as well. 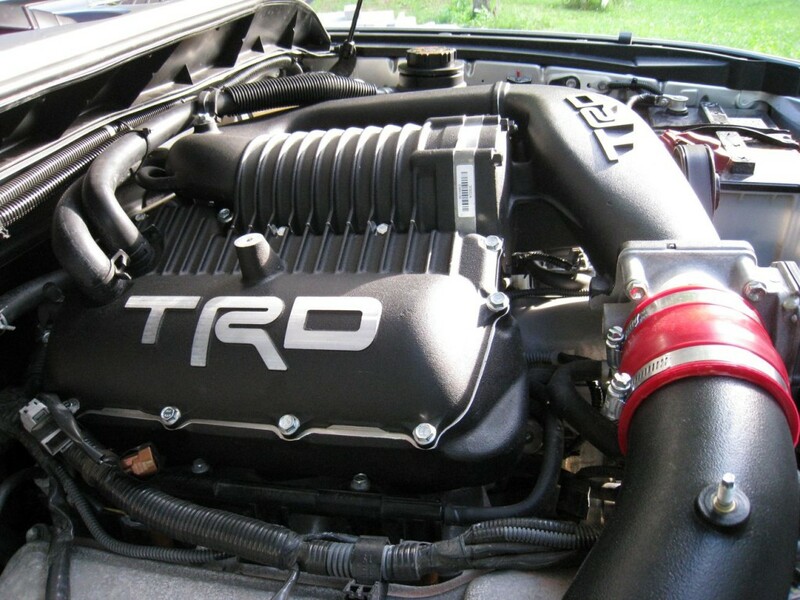 The TRD CAI will add a throatier sound to your FJ as well as allow your engine to breathe a bit more easily, so it’s a good upgrade in my opinion. As far as looking different goes, it could be a couple of things. 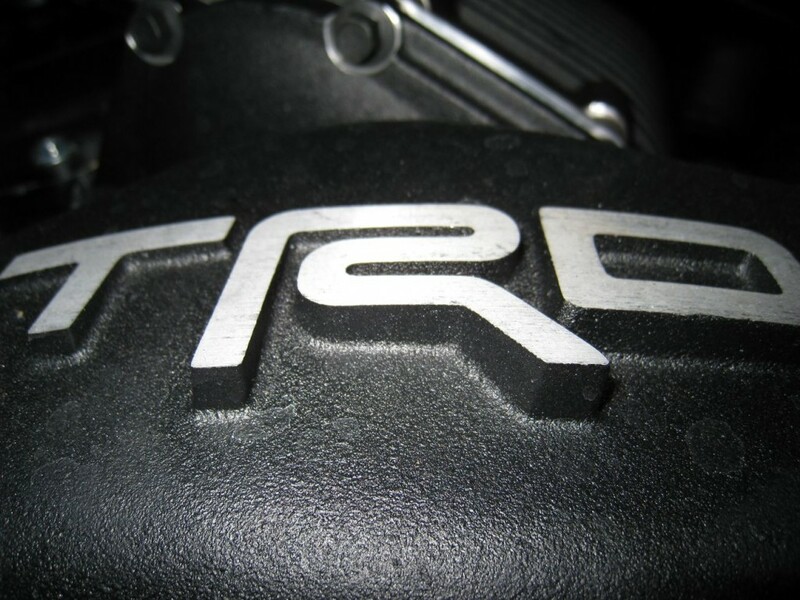 There was a slightly modified version of the TRD CAI for the 2010 models and above. The other possibility is that you actually received an AFE branded CAI which looks very similar to mine except it has the AFE logo on the aluminum plate instead of the TRD. Great piece, thank you for taking the time! I’ve added several mods (ARB bull-bar front, Kaymar rear bumper, All-Pro sliders, full skid plates, Gobi Stealth roof rack, all of which are sprayed with Line X) and typically travel with a roof-top tent, so my FJ is also one heavy-rollin’ rig. I’m very seriously considering the TRD SC, and my primary concern/hope is that it will allow the truck to cruise easier at (legal) highway speeds. As is, if there’s even a bit of wind, the poor thing shifts A LOT in order to maintain speed. Do you think the torque gained with the TRD will lessen (better yet, eliminate!) this? Also, should I get my hopes up that’ll it’ll see even a small increase in highway MPG? Thanks! From what you describe for mods, I suspect that the TRD supercharger (SC) will be a very nice addition. One of the main reasons I chose the SC path was due to the additional weight and increasing sluggishness after modding. From my limited understanding of the install process, the reflash that is applied after the SC installation will adjust your engine timing and transmission shift points to operate optimally with your new setup. I did notice a significant difference in power and responsiveness and pulling a trailer is much easier now than before the SC install. The other option you might consider is having your FJ re-geared. A lot of guys that tow replace the stock gears with a 4.56 or 4.88 ratio setup which helps a lot with the constant down shifting that occurs with the stock 3.73. As far as mileage improvement goes, I wouldn’t get my hopes up, but a lot of it depends on how you drive. Thanks for the comment and good luck with whatever you decide to do. hi,do you think can i instll trd superchager in my fj cruiser? my fj is 2011 and it has 260hp. I’ve heard different answers to your question but I think a lot of it boils down to your previous mechanical experience and/or a willingness to learn something new. From what I’ve been told, the Roots style superchargers are simple enough in their design that anyone SHOULD be able to do the install themselves with the proper tools. But I don’t think I’d go so far as to say the installation is simple. Even with a step by step list of procedures I suspect this install would have taken me a minimum of 3 or 4 days to complete (probably even longer). But I have zero experience with this type of thing. The Toyota dealerships estimated anywhere from 7-10 hours for installation by a certified, knowledgeable mechanic. I opted to have Toyota do the install to ensure I maintained my warranty and to avoid damaging or destroying my motor. But for those folks with more mechanical expertise, you may be able to save yourself a cool grand by doing the install yourself. Lastly, and not to be the bearer of potentially bad news, but you might want to check on parts availability. Last I heard, TRD had still not produced a supercharger kit that was compatible with the 2010 and later model FJ Cruisers. Rumor had it that one was expected to be released some time in 2012 but I don’t have anything more concrete to go on at the moment. The demand has to be pretty high though so I suspect it’s only a matter of time before you see the parts available. If you do find the parts and opt to the do the install yourself, be sure and post back and let us know how it went. And thanks for your comment! Any idea when TRD SC will be available for 2010 FJ? To date, I have still not heard confirmation from Toyota reps on a release date. The last I heard was it was to be available sometime in 2012 but I haven’t seen any follow up on that to know if it’s accurate or not. My suggestion to those who are eager to upgrade to a supercharger is to either purchase a 2009 or earlier model FJ or give URD a call and see what kind of options they can supply. Best of luck either way. So, my FJ goes to the local dealer next week for the SC install. Prior to making the leap, I got on the phone with a TRD product specialist to find out why they specifically list the CAI as being incompatible with the SC (and using them together WILL supposedly void the SC’s warranty). The guy was courteous and willing to help, but could only tell me that the SC was designed for use with the standard air box. The hint was it’s an emissions issue, as in it may not be compliant with California standards. So, have you had any issues relating to the use of the SC with the TRD CAI? Thanks a ton! Good to see you back and it sounds like you’re about to get a very nice addition to your FJ. Congrats! As far as the CAI is concerned, I’ve had absolutely zero issues with this setup and I’ve been running the CAI in combination with the TRD supercharger for close to three years and more than 60k miles. While I can’t speak to the Toyota warranty issue, I’ve never had any difficulties getting work done at my local dealership. Congratulations again and have fun with your new toy! Wow, thank you! I absolutely hate forums because of the useless, mindless chatter. But I suffer that sifting through that stuff in hopes of finding sites and threads like yours. Super valuable. No questions for you…. just saying thanks and I’ll be scouring the rest of your site now. Thanks for the complimentary feedback! I hope you find the site useful and please feel free to post up any questions you might have. I’m more than happy to assist where I can. Thanks for visiting! The TRD supercharger is still one of my favorite modifications to date. It was installed around 30K miles if I recall and the FJ now has around 96K on the odometer. Absolutely no issues whatsoever. I’m still very happy with this setup. Thanks for the comment! I was thinking of doing the very same thing to my fj and am curious as to what it does to the gas milage? If you drive with a light foot, you may or may not notice a significant difference. However, once the supercharger is installed, most people want to take advantage of the added power and that heavy foot will typically result in a 1-2 MPG reduction. A lot of it comes down to how you drive. For my requirements, the supercharger has been hugely beneficial and given a choice to do it over again, I definitely would. Hi, great site! Like others, i am waiting for a SC for the 13 model. My question though, is where did you get the sweet TRD rocker covers?